Ukraine's parliament has narrowly voted in favour of making Yulia Tymoshenko, a leader of the 2004 Orange Revolution, prime minister for the second time. Ms Tymoshenko was elected by 226 votes in a 450-seat parliament. The opposition boycotted the vote. She was backed by her Orange Revolution ally, President Viktor Yushchenko, who had sacked her during her earlier tenure as prime minister. Ukraine has been without a government since a general election in September. 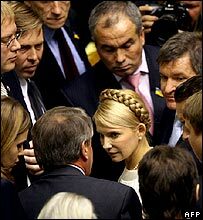 Speaking before Tuesday's vote, Ms Tymoshenko insisted her alliance with Mr Yushchenko was firm. "You have two patriots in politics who will hold this flag up high and never drop it. "Today's vote is a moment of truth for the democratic coalition," she said. Ms Tymoshenko fell short of becoming prime minister by a single vote last week. MPs from the Party of Regions, led by Viktor Yanukovych, did not take part in Tuesday's vote. The party represents Ukraine's Russian-speaking east and won the single largest share of votes in the last election. Mr Yanukovych is a former prime minister whose controversial election to the presidency in 2004 sparked the street protests later dubbed the Orange Revolution. He was eventually forced out by the protests and replaced by his rival, Viktor Yushchenko. Ms Tymoshenko draws her support from the west of the country. A businesswoman with a background in the energy industry, she is well known for her fiery oratory and photogenic looks, topped by distinctive golden braids.